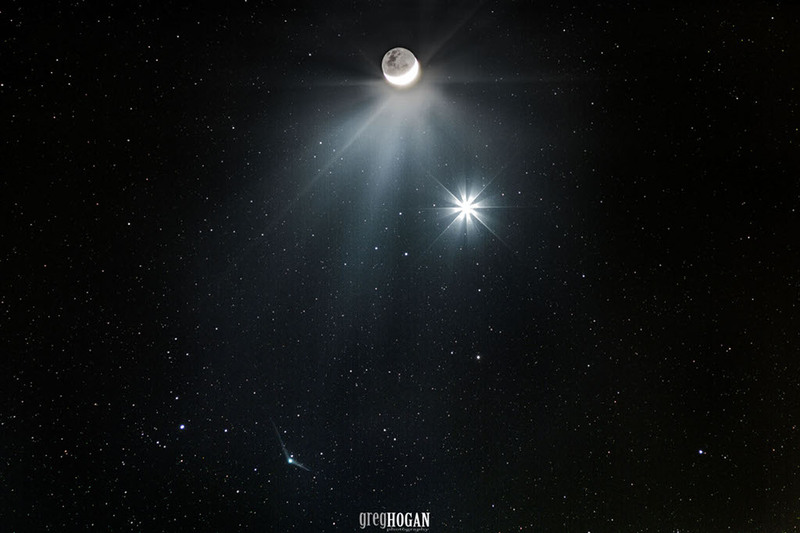 Explanation: A crescent Moon and brilliant Venus met in predawn skies on December 7, a beautiful conjunction of planet Earth's two brightest celestial beacons after the Sun. Harder to see but also on the scene was Comet Catalina (C/2013 US10). The fainter comet clearly sporting two tails, lunar night side, bright sunlit lunar crescent, and brilliant morning star, are all recorded here by combining short and long exposures of the same field of view. Pointing down and right, Catalina's dust tail tends to trail behind the comet's orbit. Its ion tail, angled toward the top left of the frame, is blowing away from the Sun. Discovered in 2013, the new visitor from the Oort cloud was closest to the Sun on November 15 and is now outbound, headed for its closest approach to Earth in mid-January.